Indicates the class of tsunami seen in 2011 in the Great East Japan Earthquake, which in some places exceeded 30m. Warns of tsunami of height 3m or more. Warns of tsunami of height 1m to 3m. Warns of tsunami of height 0.2m to 1m. If you are at the beach, immediately get out of the water and evacuate to higher ground. 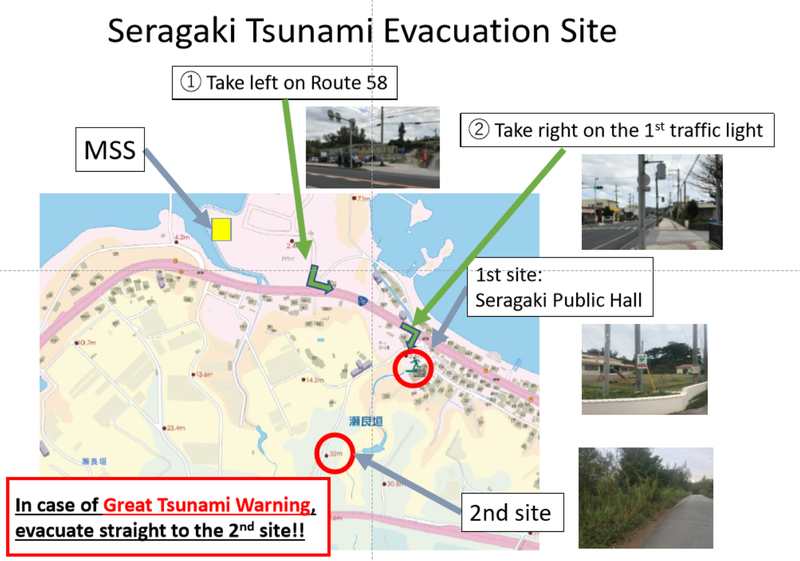 Immediately evacuate to a tsunami evacuation area/building. Be aware of 2nd wave, stay there until the warnings are lifted. Dock at the wharf/pier, immediately evacuate to a higher ground/tsunami evacuation area. Follow the directions of the Japan Coast Guard if available.. Escape offshore as far as possible. Follow the directions of the Japan Coast Guard if available. The OIST main campus is located more than 50m above sea level. You stay here in case Major Tsunami Warning with Huge Tsunami was issued by the Japan Meteorological Agency. Protect yourself. Shelter under a table/desk if tremors occur. After tremors have subsided, turn off the gas, switch off the power, if used. 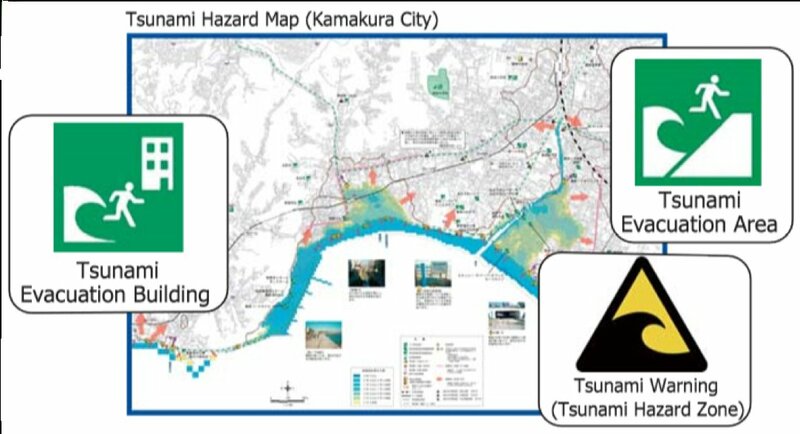 Obtain information from TV, radio, internet about the tsunami. 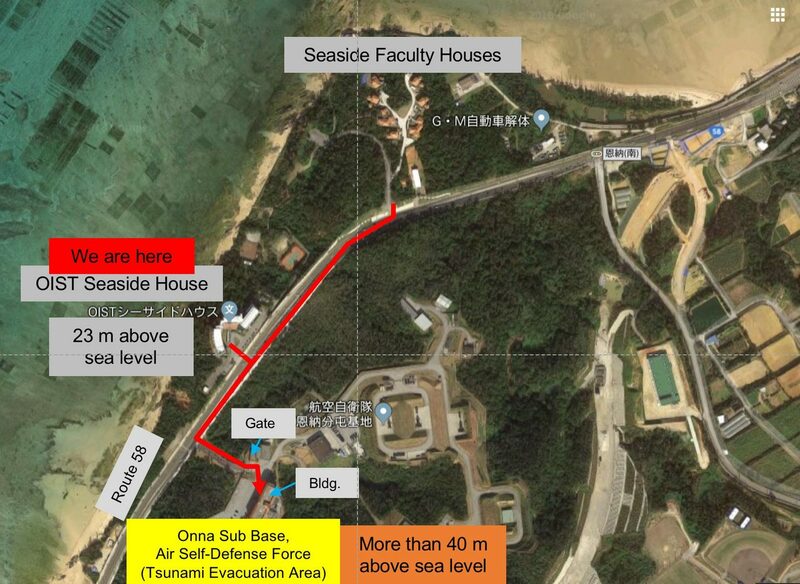 If a major tsunami warning with huge tsunami height is issued, evacuate to the building of the Onna Sub Base ASDF. Do not use a car because the roads will be congested with traffic. Do not return until the warning is lifted. Know the tsunami evacuation areas near your house. Know the meaning of sign boards. Study the hazard map for your area. Know the sea level of the evacuation area (more than 30m above sea level is preferable). Download a Sea Level Map from the list below. Go to the Sea Level Map page of the Okinawa Prefecture Website. Click the area on the map where you live.